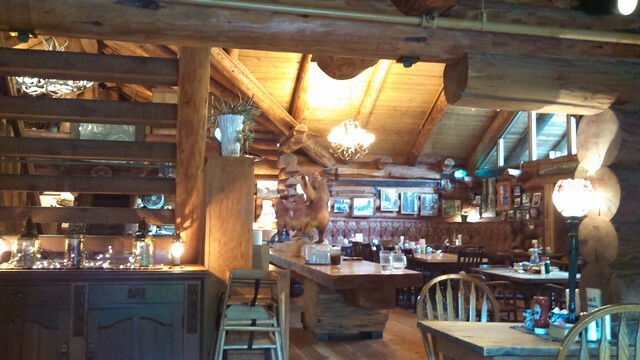 Last night we went to dinner at the Camp 18 Restaurant and Logging Museum. The icon on this post is a sign posted on one of the buildings at Camp 18. I've written about Camp 18 before, and this post is a bit repetitive. The building is a log-built lodge constructed from trees felled and milled on the property itself. 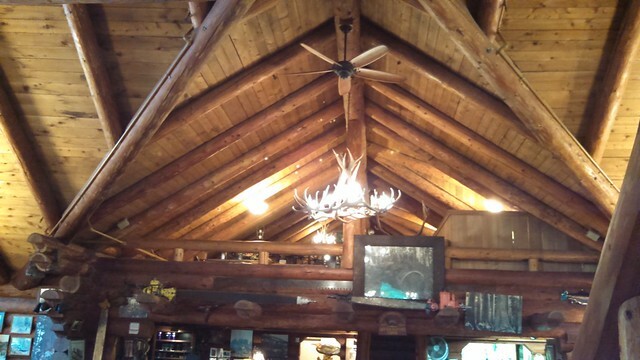 The main roof beam is a single huge log. We think the whole place is gorgeous. We had a little alcove to ourselves. The only bad part of that was that we couldn't watch the birds outside on the balcony. The bird feeders here are alive with birds of all sorts. Also cats, looking up longingly at the birds but unable to reach the feeder areas. Lisa and I had the same thing we had the last time we were here: the porterhouse steak with sauteed mushrooms. It was as delicious as I remembered. Lisa was a little disappointed because the nature of the steak makes it hard to get it done as well as she wants near the bone, so she'll need to remember to order it well done next time just to make sure there's not much pink in it; however, it was still good. We were the last customers of the night in the main restaurant, but we were not really holding things up because they were hosting a large banquet for a logging company downstairs. (Somewhat surprisingly to me, this did not affect service in the main restaurant.) 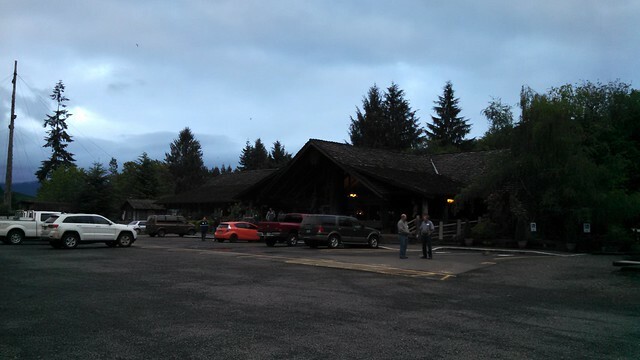 When we first arrived at the restaurant, Lisa observed the lot full of trucks and quipped, "I don't think they'll serve us; we don't have a pickup truck." The banquet was breaking up as we were finishing our meal. 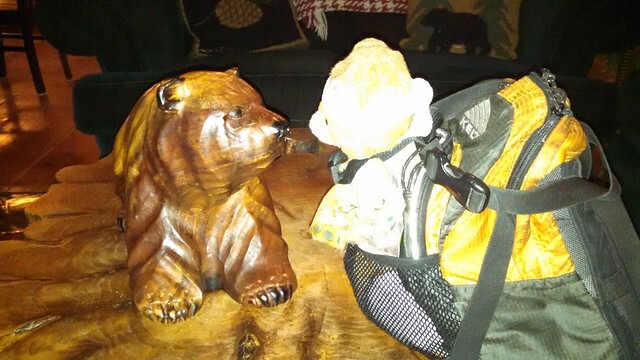 While I settled our bill ($95 including tip), travelswithkuma made acquaintance with one of the many carved bears in the building. This one seems friendly. 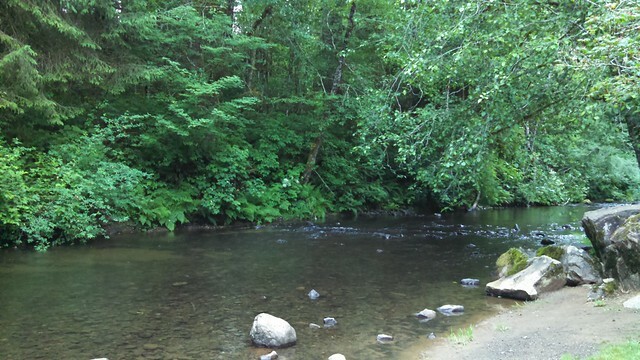 We have to be careful around Camp 18, though, because while Bear likes fishes, there's one here that gave Kuma nightmares on a previous visit. 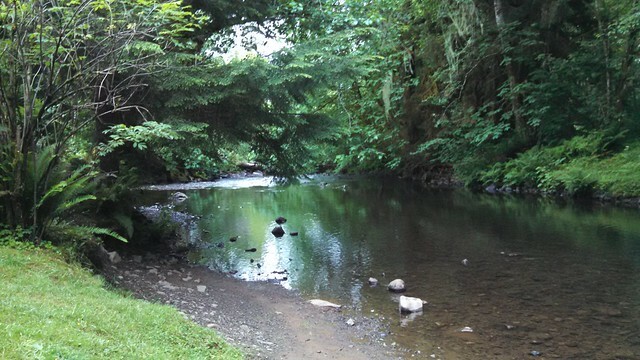 At this time of year, there's plenty of light even after 8 PM, so we had time to wander down to adjacent Humbug Creek to see if there were any fishes for Kuma Bear to look at. "What's a Humbugs?" asked Bear, "Is theys a kinds of fishes?" After a bit more of a wander around the grounds after dinner, we headed "home" to the condo in Seaside. For some reason it seemed to take less time to get back to the condo than it took to get to the restaurant, but that probably was because we were hungry going out but not back. It was very nice to get to bed relatively early and to not fret about moving out tomorrow morning.